This exhibition includes a series of assemblages constructed from found objects washed up on the Macleay Island foreshore. Discarded materials are given a new life by local artist Jan Rybinski as she transforms discarded wood, rusted metal, coins, keys, bones, bottle tops, toys and plastic into carefully considered compositions. 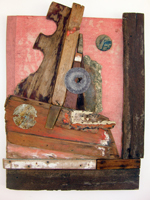 Image caption: Jan Rybinski, The Ancient of Ships (detail) 2004, wood and found objects. Courtesy of the artist.